The Ontario ON8848-BRK Rat-1 is one of the best pocket knives under 30 dollars of low-priced, hard use and able to cut through nearly everything you fall on it. Ontario Knife company is known for its quality components, uncompromising craftsmanship and has one of the widest product lines in the cutlery industry. Also, the company is a worldwide supplier especially to the United States Government and its armed forces. Ontario Rat-1 folder features a 3.5 inches satin finished blade which is made of traditional Japanese AUS-8 Stainless Steel (55-56 HRC). The drop point blade has a plain edge style and full flat grind shape is great for slicing and other utility chores. Japanese AUS Steels are famous for its strength, higher edge retention, easy and faster to sharpen. Its open length is 8.5-Inch, closed length 4.5-Inch and weight 5 oz. Also, the knife is crafted with a user-friendly handle with nylon scales over the stainless steel liners. It has a spine jimping which allows for excellent control and a perfect shape choil that protects your fingers from the sharp edge. The 5-Inch long handle makes holding and handling comfortable even your hands are larger. As a tactical folder, the handle works pretty well in both reverse and forward grips. Furthermore, Rat-1 features a liner locking mechanism, so the knife is safe for any hard use. It also allows for a swift and easy one hand opening, all thanks to its big thumb studs. Its open structure was designed for easy maintenance and cleaning. The folding knife has a pocket clip of a 4-way (tip-up, tip-down, left/right handed) position for carrying, as well as a lanyard hole option too. Ontario offers a variety of several colors scales and a limited lifetime warranty on this knife. 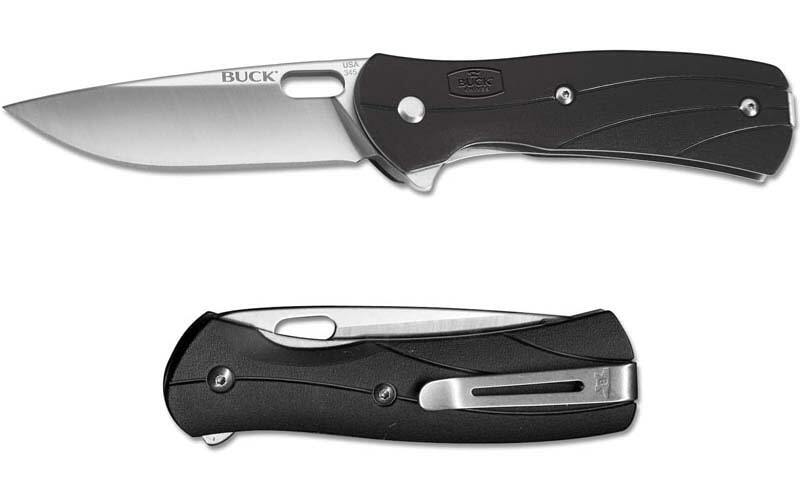 I am really surprised when I found that the Buck Vantage is made in America and available under 30 dollars. Its 3.25 inches plain edge blade made of 420HC stainless steel with a satin finish. 420HC steels has 58-60 Rockwell hardness, excellent wear resistant and easy to sharpening. Because of its higher edge retention, you would not be needed sharpening frequently. Drop point razor sharp blade with a high hollow grind make it a tremendous cutting tool for slicing, hunting, skinning, feathering or chapping sticks and overall any utility purpose. The 7.63 inches knife has a black Glass Reinforced Nylon made handle. Smooth scales and steel liners of the handle are attached with screws to give toughness. Moreover, the ergonomic design of the handle makes it easy to use it continuously for a whole day. Through its flipper and thumbhole feature, you can simply deploy and lock the blade applying just single hand. To enhancing safety and strength, it is designed with two stainless steel liners. The edc knife brings a tip-up pocket clip and it can be altered for both handed use. Also, Buck provides a limited lifetime warranty with this pocket knife. 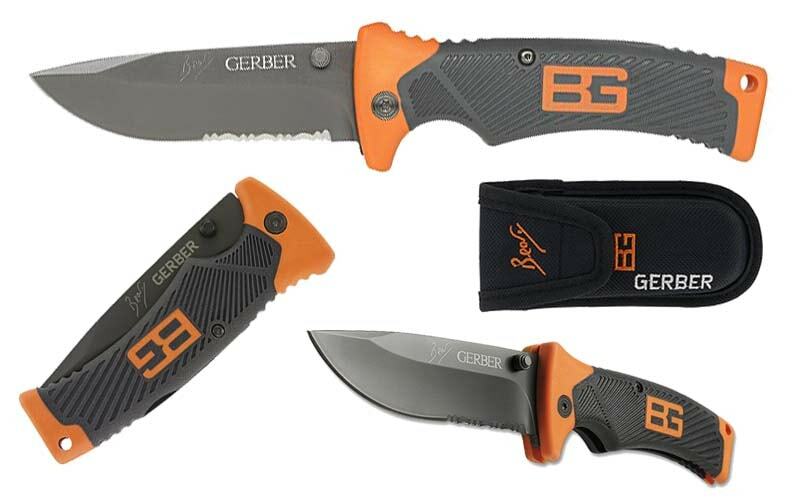 This compact knife has built up with the collaboration between survival specialist Bear Grylls and Gerber. Its 3.6 inches drop point blade is created with High Carbon Stainless Steel and finished with Teflon coating. The combination of these two elements enhances the blade durability, corrosion and rust resistance. Because of its higher HRC 57-59 and Carbon ratio, the edge retention of the blade is very good after a heavy use. The half serrated blade is ideal for feathering or chapping sticks, firewood batoning, slicing and cutting flexible material like webbing, rope, set belt, electric cable etc. In the handle, the major structure or orange parts are constructed with TPE Overmold premium quality plastic. The gray color rubber grip area of the handle is made of ergonomic textured. The rubber grip pattern prevents slippage and protects from serious injury as well as ensures maximum comfort when using it in any hard work. Gerber Bear Grylls Folding Sheath Knife is equipped with lock back system. The thumb stud on both sided helps easy and quick single-handed deploying. The pocket knife comes with exceptionally lightweight and durable nylon sheath which is military-grade and mildew resistant. This edc knife under $30 has a lifetime warranty. The folding knife is a perfect tactical gear for survivalist, hunter, camper, outdoor traveler, law enforcement, military personnel, knife enthusiast or collector. Its complete length is 8.5 inches and the folding length is 4.9 inches and weight 4.3 oz. The bonus – Bear’s “Priorities of Survival” pocket guide. 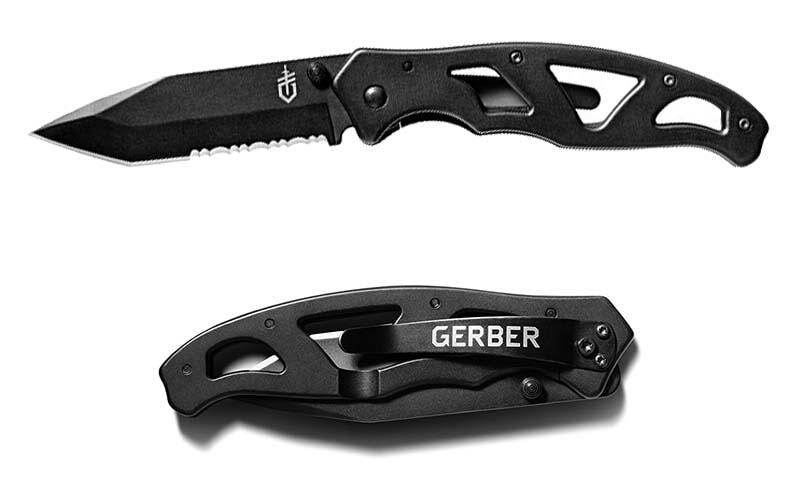 Since the 1939s, Gerber Company has been producing world’s best outdoor tools and several types of knives especially for survivalists, hunters, sportsmen, law enforcement officers, and outdoor enthusiasts. If you knew Gerber before now, then you will understand that its gears and knives are made durable and quality enough to stand the test of time. No doubt, the large Paraframe II Pocket Knife will not be less of wonder itself. Firstly, this best tactical EDC knife has a very lightweight (4.30 oz) open frame construction. So, the knife is easy to open, carry and clean. The tanto point blade is constructed with sturdy 7Cr17MoV Stainless Steel (58-59 HRC) and covered by black titanium nitride-coated finish. 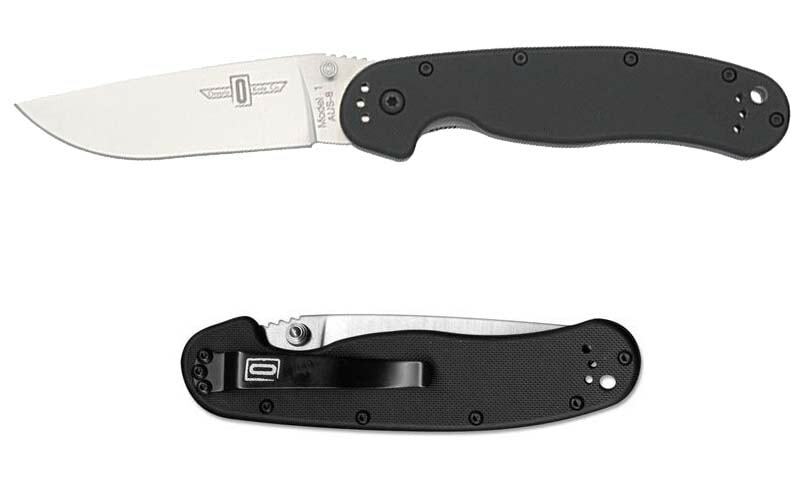 Also, the 3.5-Inch has a partially serrated blade for multiple tasks. The handle of this best folding knife under $30 is made of 3Cr13 Stainless Steel. Its naked and skeletonized structure cut down on additional weight that is an innovative craftsmanship for a large tactical folder knife. Also, the handle is carved out in a way that provides optimum comfort and firmness when you hold your knife. You will agree with me that this edc knife is portable enough to be carried around every day and every time. It can easily be added to your pocket clip, with the tip down option and your knife is well kept and safe. It features a dual thumb studs one-handed opening mechanism for easier and faster blade deployment. Also, its folding mechanism is a frame lock type for safety. To assure you of quality, this blade has a lifetime warranty. Also, the knife is available in different blade lengths.